Whey protein and lactose are both found in milk, but they can be separated from the milk through a lengthy process. Whey does contain lactose, but if you're mildly or moderately lactose intolerant, you may be able to use whey protein without any symptoms. 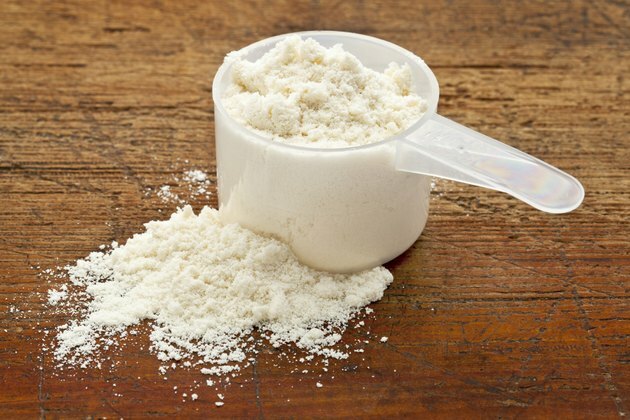 Most whey protein powders contain 0.1 gram of lactose per tablespoon of powder, according to the Whey Protein Institute. If you're severely lactose intolerant, you may need to use a lactose-free protein powder, such as a soy-based protein powder. Before changing your dietary habits, talk with your doctor. Whey protein is derived from cow's milk. Whey proteins are found in the portion of milk that remains liquid after it curdles. The curd or the hard part of milk contains casein proteins. Whey protein powders are made by dehydrating the liquid portion of the milk and are commonly used to add protein to weight-gaining shakes, bars and other products. Whey protein is listed in the ingredients on prepackaged foods, making it easy to identify. Lactose is a sugar found in milk that causes digestive difficulty for some people. Lactose is a complex sugar that cannot be digested and absorbed into the body without first being broken down into galactose and glucose. If you're lactose intolerant, you lack the enzyme lactase. Without lactase, the lactose remains in its undigested states, leading to complications when it enters the colon. Lactose interacts with bacteria in the colon, causing gas, diarrhea, bloating and stomach pain. If you develop these symptoms while using whey protein, you should stop using the supplement and call your doctor. The most effective treatment for lactose intolerance symptoms is to take a lactase supplement before taking your first bite or sip of whey protein. Taking the supplement will provide your body with the necessary amount of lactase to successfully digest the lactose in whey products. You may be able to handle a certain amount of lactose without taking any medication. Consume 1 teaspoon of whey protein powder to observe if you develop symptoms. Each day increase the amount you ingest by 1 teaspoon until you consume a normal serving or you develop symptoms. If you've been diagnosed with a milk allergy, which is commonly confused with lactose intolerance, avoid the use of whey proteins. Ingesting whey proteins can cause mild to severe allergic reactions such as hives, facial swelling, asthma and digestive complications. If you develop these symptoms, talk with your doctor about allergy testing.